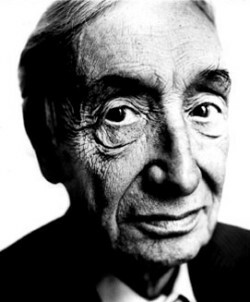 Sir Alfred Jules ("Freddie") Ayer (better known as Alfred Ayer or A. J. Ayer) (1910 - 1989) was a 20th Century British philosopher in the Analytic Philosophy tradition, mainly known for his promotion of Logical Positivism and for popularizing the movement's ideas in Britain. Alfred Ayer was born on 29 October 1910 in London, England, into a wealthy family of continental origin. His mother, Reine, was from a Dutch-Jewish family; his father, Jules Louis Cyprien Ayer, was a Swiss Calvinist. He grew up in the well-to-do St. John's Wood area of London, and was educated at the exclusive Ascham St. Vincent preparatory school for boys at Eastbourne, and then at even more prestigious Eton College. A precocious but mischievous child, Ayer always felt himself to be something of an outsider. From an early age, he tried to convert his fellow students to Atheism, and at the age of 16 he started to show a serious interest in philosophy, duly impressed by his reading of Bertrand Russell's "Sceptical Essays" and G. E. Moore's "Principia Ethica". In 1929, he won a classics scholarship to Christ Church College at the University of Oxford, where one of his philosophy tutors, Gilbert Ryle (1900 - 1976), introduced him to Wittgenstein's "Tractatus". Ryle, who became a major figure in the Ordinary Language Philosophy movement, also enabled the young Alfred to study for a time with Moritz Schlick (1882 - 1936), then leader of the influential Vienna Circle, out of which the Logical Positivism movement grew. From 1933 to 1944, he was a lecturer and research fellow at Christ Church, Oxford. During World War II, Ayer served in the British military, working for the Special Operations Executive (a secret intelligence and espionage unit) and helping to organize the French resistance movement in London. He was popularly known after the War as a participant on the BBC discussion program "The Brains Trust". He was a noted social mixer and womanizer (he was married four times), and enjoyed dancing and attending the London clubs, as well as being a well known face in the crowd at his beloved Tottenham Hotspur Football Club, where he was known as "The Prof". Despite his reputation for aloofness and vanity, his circle of friends included many famous names in the fields of politics, literature and philosophy. In the 1950s and 1960s, Ayer kept up a hectic schedule of lecture tours throughout Europe and South America, and then later in China, Russia, India and Pakistan. He taught and lectured several times in the United States, including serving as a visiting professor at Bard College in New York State. In 1963, he had a son, Nicholas, by his second wife, Dee Wells, an experience which apparently had a profound effect on him. Throughout this period, he continued to be active in the British Labor Party, which he had first joined before the War. Among other honors, he was knighted in 1970. He is generally considered to have been an outspoken atheist, although "igtheist" (a person who believes that "God" denotes no verifiable hypothesis) may be a better description. However, in 1988, shortly before his death, he received much publicity after an unusual near-death experience, which weakened his inflexible attitude that there is no life after death, and prompted him to write an article called "What I saw when I was dead". He died of a collapsed lung in London on 27 June 1989. A. J. Ayer had a crisp, clear and informative writing style, in which he could lay bare the bones of a philosophical difficulty in a few paragraphs of strikingly simple prose. He is often considered second only to Bertrand Russell among British philosophers of the 20th Century in the depth of his philosophical knowledge. Ayer began the book that made his philosophical name, "Language, Truth, and Logic", at the tender age of 23 as a young lecturer at Oxford, and it was published three years later in 1936. The book is regarded as a classic of 20th Century Analytic Philosophy and Logical Positivism, and is still widely read in philosophy courses around the world. In it, he popularized the verification principle (an issue at the heart of the debates of the Vienna Circle at the time), that a sentence is meaningless unless it has verifiable empirical import (see the section on Verificationism). He also claimed in the book that the distinction between a conscious human and an unconscious machine merely resolves itself into a distinction between "different types of perceptible behavior" (a contentious argument which anticipates the 1950 Turing test of a machine's intelligence or consciousness). He also put forward an emotivist theory of Ethics (a kind of Moral Anti-Realism or Non-Cognitivism, which holds that ethical judgments are primarily just expressions of one's own attitude and imperatives designed to change the attitudes and actions of others), which he never abandoned. His later works include "Foundations of Empirical Knowledge" (1940), "The Problem of Knowledge" (1956) and "Logical Positivism" (1966). In 1973, his "Central Questions of Philosophy" was published. The book was a comprehensive confirmation of his Logical Positivist outlook that large parts of what was traditionally called "philosophy" (including the whole of Metaphysics, Theology and Aesthetics) were not matters that could be judged as being true or false and that it was thus meaningless to even discuss them. These claims, and his complete rejection of the possibility of synthetic a priori knowledge, made him rather unpopular among other British philosophers. For many years he kept up a highly public ongoing battle against the Ordinary Language Philosophy of J. L. Austin (1911 - 1960) and Peter Strawson (1919 - 2006) in particular.